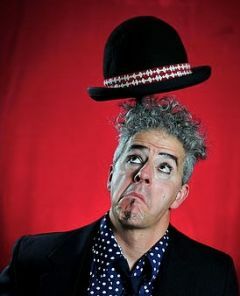 International touring physical comedian and storyteller, Thomas Schroyer has performed from the West Coast to NYC and has just returned from a festival/theater tour in South America. Being partially deaf has given him the opportunity to explore the world of body language and mime with his entertaining performances. He has performed two silent one-man shows with his comedic character, Tommy Twimble and has written and directed for Madcap Vaudeville. He loves writing sketches and stories in his Portland studio or doing absolutely nothing at his Mt Hood cabin.